Streets are the physical spaces where city goals take shape. To make the most of streets, use an integrated approach to stormwater management, mobility, and land use that is both intentional and opportunistic. Coordinate street infrastructure projects and align goals to maximize the value of public investments, avoid conflicting construction schedules, and unlock complementary benefits. 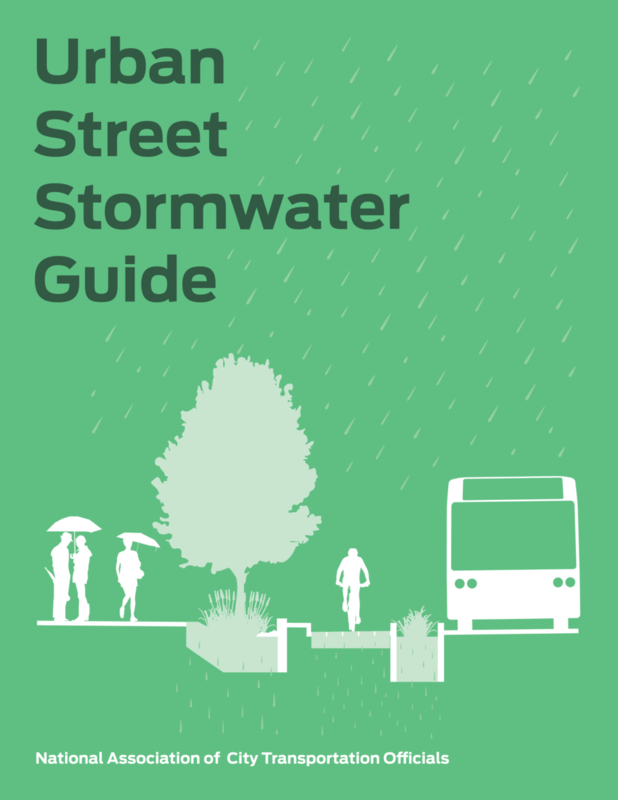 Overlay stormwater network plans with plans for bicycle infrastructure, pedestrian safety improvements, transit routes or stations, and public space investments to better predict and plan for opportunities for co-investment. 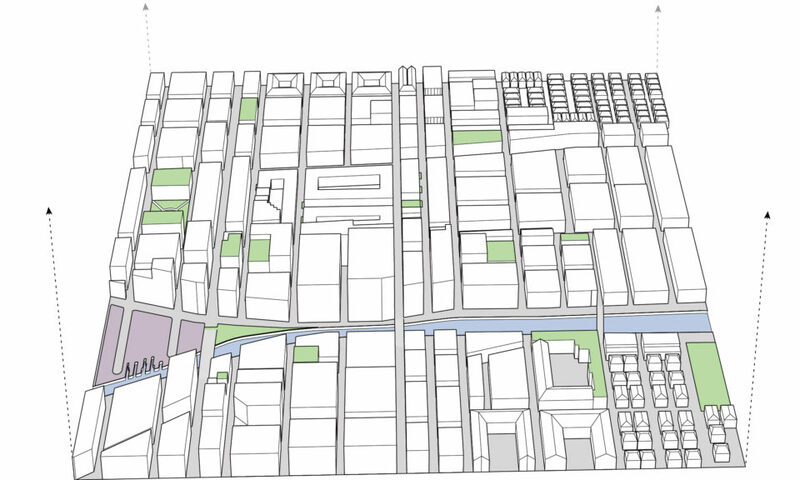 Land use and zoning changes that accompany site redevelopment should include stormwater management strategies in the right-of-way alongside opportunities to improve multi-modal mobility. Consistent and thoughtful partnerships between city agencies and other stakeholders, such as transit agencies or business improvement districts, are critical to aligning goals and developing holistic street design projects (for further information, refer to Collaboration & Partnerships). A network of green infrastructure can be leveraged for additional sustainability goals, including increasing park density, reducing the urban heat island effect, and connecting people with greenery. Automobile-oriented transportation policy results in wide streets and high impervious surface cover. 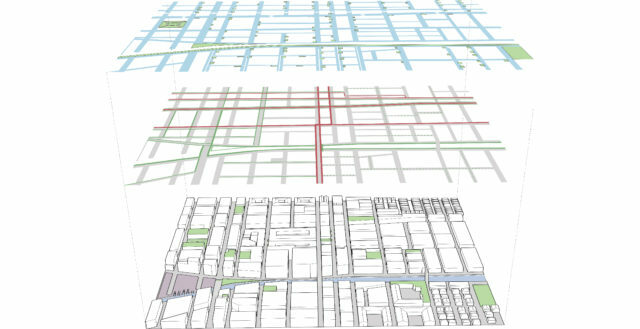 Geometric changes to the street that improve conditions for people walking, bicycling, and riding transit also unlock space for green infrastructure. 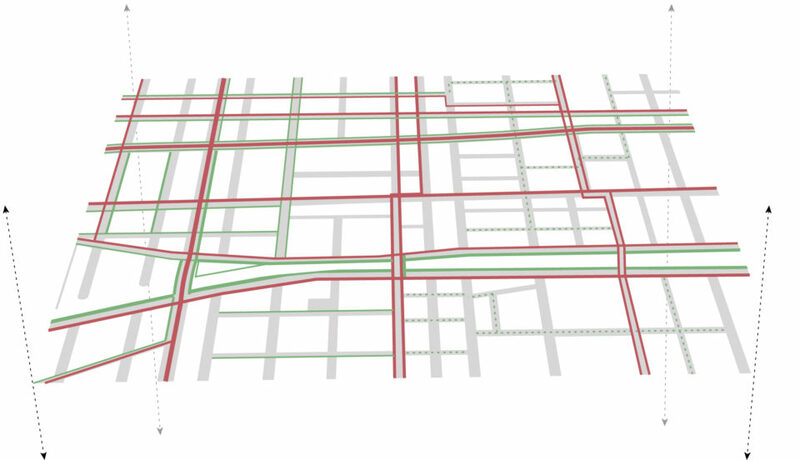 Analyze motor vehicle volume and speed at a network level to identify streets that are “over-designed” for vehicles. Reallocate excess travel space recaptured by street redesigns to increase pervious surface and improve safety and comfort for all travel modes. Biking: Implementation of high-quality bicycle facilities can be aligned with green infrastructure, including pervious pavements and bioretention facilities in buffer spaces. Walking: Integrate GSI on sidewalks and at intersections to widen walkways, create bulbouts for intersections and potentially midblock crossings, and calm traffic by providing visual cues to motorists to reduce travel speeds, creating safer and more pleasant conditions for pedestrians. Transit: Major investments in high-capacity transit such as light rail can open connected linear space for GSI. At a smaller scale, spot treatments for better transit service, like boarding bulbs and islands, can include greenscape and improve the rider experience. Coordination with the transit operator is critical for mutual success. Zoning codes and land use regulations dictate development patterns and impervious surface cover. Streets, roofs, and parking lots generate runoff if stormwater is not managed on site. Zoning Codes: Consider the role of zoning codes in creating impervious surface cover and influencing travel behavior, such as by requiring a minimum number of parking spaces for residential or commercial buildings. Regulations and Incentives: Enact or revise land use regulations to encourage or require the use of green infrastructure to manage stormwater runoff on site. Use development incentives to address stormwater that falls on building roofs and private property. Revise zoning codes to encourage walking, biking, and transit and reduce impervious surface cover. Sustainable Development: Connect green infrastructure in the right-of-way with offsite infiltration galleries, such as public parks and plazas where there is more available space. Consider how specific land uses affect stormwater strategies; for example, current or redeveloped industrial land uses may require environmental remediation to remove pollutants from the soil and watershed prior to implementation of green infrastructure.